The WindTech 300 Series microphone windscreen is designed to fit any microphone measuring 1-3/8" (41.275mm) in diameter. The windscreen offers optimum wind diffusion and will fit select AKG, Audio-Technica, Audix, Beyerdynamic, Telex, Sennheiser and Crown Models. Color: Neon Pink . 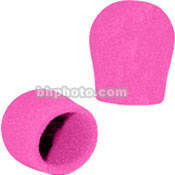 Box Dimensions (LxWxH) 3.5 x 2.0 x 1.75"
300 Series - 1-3/8" Inside Diameter - Neon Pink is rated 4.0 out of 5 by 1.